Over the past few years plenty of sites surfaced online offering tax filing services at a very nominal fee but the easiest way to file income tax return online is via Indian Income Tax Site (https://incometaxindiaefiling.gov.in/) but one must have basic knowledge of the tax laws to successfully file ITR. In this article we will discuss about following aspects of filing of income tax return online. Which ITR is applicable for you? What are the additional details required for filing Income Tax Return Online? How to File Income Tax Return Online using Indian Government Site for free? Income Tax Return is a document in which assess is required to report his incomes from various sources under the head of Salary, House Property, Capital Gains, Business or Profession and Other Sources. Against incomes there are plenty of deductions available u/s 80C to 80U which are to be deducted from gross total income before calculating Tax Liability. Every assesse whose total income exceeds the threshold limit (Rs.2,50,000/- for current assessment year) before claiming the deductions under section 80C to 80U, needs to file Income Tax Return. The Income Tax Return is to be filed with the Apex body of Income Tax i.e. Central Board of Direct Taxes (CBDT) before the due date u/s 139(1) i.e. 31St July for Individuals and 30th September for Companies for the previous year. For better understanding, ITR for the income earned in the financial year 2014-15 is to be filed on or before 31st July/30th September 2015 as the case may be. In case you have made any mistake in filing the tax return then the same can be change by filing Revised Return u/s 139(5) which is to be filed on or before the expiry of 1 year from the end of relevant assessment year before the completion of assessment, whichever is earlier. For example, Revise Return for FY 2013-14 can be filed up to 31St March, 2016 or before the completion of assessment, whichever is earlier. If you forget to file the return on or before the due date then you can go with the Belated Return u/s 139(4) which can be filed before the expiry of 1 year from the ending of the relevant assessment year or before the completion of assessment, whichever is earlier. For instance Belated Return of FY 2013-14 can be file up to 31St March 2016. There are 9 different Income Tax Return Forms available for reporting incomes under various heads which are to be chosen based on the sources of income. ITR-1 is the simplest form and mostly used by the salaried people. This Form is used for reporting Income from Salary/Pension, Income from One house property and Income from other sources excluding incomes from winning lotteries and horse races. In case you own more than one house than you have to file ITR-2 or ITR-2A. Similarly, if there is a brought forward loss from the last year or your income from agricultural activities is more than Rs.5,000/- in the previous year, than ITR-2 or ITR-2A is be used. ITR-2 is for the assesse having Income from Salary/Pension, Income from more than 1 house property, Income from Other Sources and Income from Capital Gains. Further, assesse having income from foreign source or is a signing authority in a foreign bank or possess a foreign asset or financial asset outside India is also required to file ITR-2. ITR-2A is the new income tax return form introduced in current assessment year to part away the problem of filing of tax return by the a certain class of assesse. ITR-2A is to be filed by the assesse having income from salary/pension, income from more than one house property but no income from capital gains. Earlier, assesse owning more than one house had to file ITR-2 whether or not they had any capital gains. But now they can file ITR-2A which is a shorter than ITR-2. ITR-2A can also be used if you have capital gains which are exempt for taxes. For example long term capital gains on sale of shares on which STT has been paid are exempt u/s 10(38). ITR-3 is applicable for assesse being individual or HUF (Hindu Undivided Family) who is a partner in a firm but does not have income from business or profession or carry business under proprietorship. ITR-3 form can be filed where taxable business income is only from the salary, interest, commission, remuneration or bonus receivable from the firm as a partner. ITR-4 is applicable for the assesse having income from business or profession. This form covers all kind of businesses and professions irrespective of any income limit. Assesse can also report his income from salary, house property, lottery winnings, capital gains, speculative income i.e. horse race in ITR-4 together with the Business Income. ITR-4S is applicable to the special cases of assesse who have business but their income is calculated on the presumptive basis u/s 44AD and 44AE. Reporting income u/s 44AD i.e. 8% of the Gross Receipts or u/s 44AE i.e. Rs.7,500/- per month for each goods carriage, does not require assess to maintain any books of accounts. But if the gross receipts or turnover of a business or profession is more than Rs.1 crore in the previous year than ITR-4 is to be file instead of ITR-4S. ITR-5 is applicable for firms, LLPs (Limited Liability Partnership), AOPs (Association of Persons), BOIs (Body of Individuals), AJP (Artificial Judicial Person), Co-operative Societies and Local Authority. ITR-6 is solely meant for the Companies under than companies claiming exemption u/s 11 which states exemption of income from the property held for charitable or religious purposes. ITR-7 is to be used by Trust and Non-Profit Organizations falls under section 139 4(A), section 139 4(B), section 139 4(C) and section 139 4(D). Though, No documents are required to be attached while filing Income Tax Return Online but assesse must have all the documents required to support his/her information furnished in the ITR. Further, following details are required to be provided while filing ITR. Details of the Savings Bank Account and Current Bank Accounts along with the IFSC of Domestic as well as of foreign bank accounts, if any. No need to disclose details of the bank account which are dormant i.e. no transactions are made during the last 3 years. Details of foreign travels regarding expenses and duration of stay are not required but assesse must quote his/her Passport Number. Aadhaar Number is mandatory for e-filing and assesse quoting aadhaar number in ITR is not required to send ITR-V form to CPC, Bangalore. Amount of Tax Credit as per Form 26AS (Tax Credit Statement) or the details of Tax deducted by employer as per form 16/16A. Few other information including DTAA, date of formation of HUF etc. are also required to provide while filing income tax return online. There are numerous sites providing services of filing income tax return online but the best is filing ITR by your own using the excel utility or java utility provided by the Income Tax Department. Quick e-filing of ITR on the site but this method is only available for ITR-1 and ITR-4S. If you are required to file ITR forms other than ITR-1 and ITR-4S, the only method you could use is through java or excels utilities. And we are going to show how easily you can file income tax return online through excel utility provided by the Income Tax Department. 1. Download the applicable ITR Excel Utility which is available in .zip format from the https://incometaxindiaefiling.gov.in/ site. Excel 2003: Select?Tools-> Macro-> Security. Set the Security level to Medium and Click on OK.
Excel 2010: Simply Enable it through the yellow bar located at the top of the sheet. If there is no such bar than use the same method as in Excel 2007. You can also get your personal information filled in using previous year?s XML file. b. Scroll down the first sheet to fill in your incomes and claimable deductions u/s 80C to 80U. c. The next sheet is of TDS where you have fill in the Tax deducted as per Form 26AS and Form 16/16A and any advance tax paid. d. Moving on to the third sheet would bring you to the place where you have to fill in the bank account details of you all banks accounts except dormant account. Along with Bank details, you will have to fill in the verification details. Remember to fill in the correct data as the tax refund would be credited in the account number you quote here. e. The last sheet is for the deduction claimed for any donations or charities u/s 80G done by you in the previous year. 4. The next step would be to calculate the tax by pressing Calculate Tax located on the first sheet. 5. As soon as you fill in all the required details hit the Validate Button located on the right side of the each sheet in Excel Utility. 6. If everything goes smooth with the validation button, generate XML file and save it your computer. 7. Logon to https://incometaxindiaefiling.gov.in/ website by using your login credentials. Remember, user id would always be your PAN number. If you forgot your password than reset it using forgot password option. The password would be sent to your registered mobile number and email id. 8. Go to e-file -> Income Tax Return and Upload the saved XML file (saved in 3rd step). 9. Choose whether you would sign the ITR by Digital Signature or not. 10. On successful uploading of the XML file, an acknowledgement message would be displayed on your screen. If you did not use digital signature in the 7th step than you would be required to take a printout of the acknowledge form i.e. 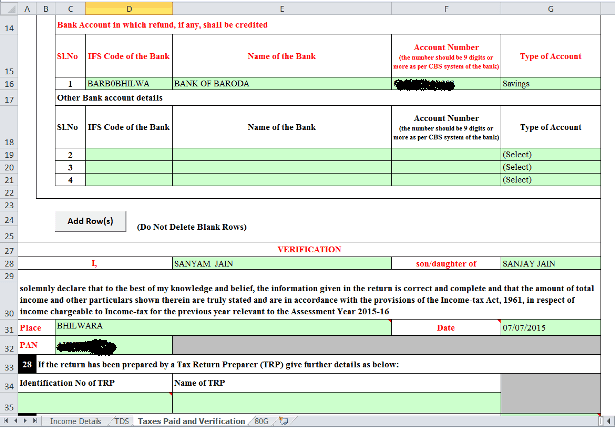 ITR-V, sign it and send it to the Central Processing Unit (CPC) Bangalore within 120 days of filing the tax return. 1. Quick E-Filing is available only for ITr-1 and ITR-4S, any other ITR should be filed either offline or online through Return Preparation Software i.e. Excel or Java Utilities. 2. 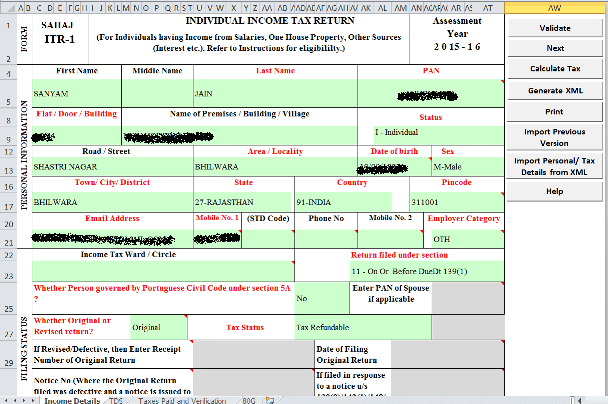 Filing Income Tax Return online via Quick E-File is similar to using Java Utility to file return offline. 3. To start with, first logon to https://incometaxindiaefiling.gov.in/ website by using your login credentials. If you forgot the password than use Reset Password to get the password on your registered mobile number as well as your registered email id. 4. Choose the applicable ITR, the assessment year and whether you would use digital signature or not. 5. The ITR contains 6 tabs which are instructions, personal information, income details, tax details, taxes paid and verification and 80G. You should start with reading the instructions to get acquainted with the colours and format used in the ITR. 6. Personal Information Tab should be filed with ease. 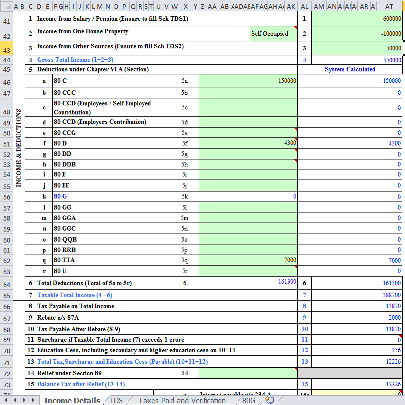 The attention is needed while filing details in cells A19 to A25. 7. Hop on to next tab of Income Details, where you have to fill in the details of your incomes and the claimable deductions u/s 80C to 80U. You have to fill in the amount and if the claimed amount exceeds the threshold limit, the utility will restrict it to the threshold limit only. The tax would be computed automatically and if there you are filing return after due date than the interest and Penalty u/s 234A/B/C would get added to your tax liability. 8. The next tab is of Tax Details wherein you have to put data as per your Form 16/16A and Form 26AS. 9. The second last tab of Taxes Paid and Verification requires details of Bank account except dormant account. The first few grayed cells (D13 to D18) would automatically fetch data from previous tabs. 10. Finally validate the filled in information and submit it. 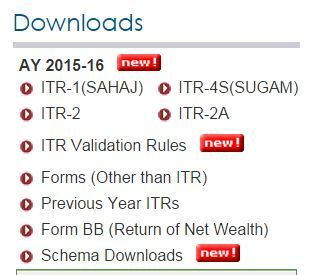 On Successful submission, a link to download acknowledgement form ITR-V would be shown on your screen. In case you have not chosen sign using digital signature than you will have to open ITR-V using your PAN as password, take a print out, sign it and send it to the Central Processing Unit (CPC) Bangalore within 120 days of filing the tax return. You can e-file your tax return wherever and whenever you want. At office, home, cafes etc. that too 24×7. All your personal information is fetched online at one click. Inbuilt Online Tax Calculator is simple and efficient to ascertain the tax liability together with interest or penalty, if any. Filing ITR Online makes you escape the cumbersome task of keeping physical copy of ITR and acknowledgement form. Tax Refunds are swift through filing income tax return online.